What text editor do you use to write? 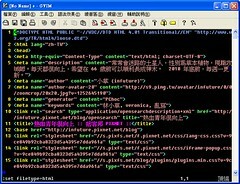 I read an interesting article today about a new text editor called PenZen. It is a distraction free online text editor that lets you get down to the business of writing. It got me thinking about a theme I notice about what people seem to want when they write. No distractions. We all want the ability to put our thoughts together. But computers fail at this miserably. “In the old days” there were no popups, the ability to check your email 100 times, switch windows to see what’s hot on Reddit. There was either a notepad to write on, or a typewriter. What did these mediums have that computers don’t? No Options. And that was a good thing! You didn’t have a gazillion buttons to play with inside Word. What font do I want to use? You could spend ALL DAY finding that out! Trust me, my fiancee took DAYS if not WEEKS to figure out the font for our wedding invitations. lol. I think this is why I find it easier to write inside VIM. It is very easy to work without distraction. Why then do we have so many fancy office suites out there? It is like we want our writing and desktop publishing to be all in one. I am not a publisher, that’s for sure, but when I am trying to flesh out some ideas, the first thing I do is get back to the basics. Close that desktop office writer. It’s far to pretty! That goes for writing for this blog. If I am trying to put together a post, and it is going to be a longer one, I get rid of all the WordPress options and open the editor in full screen mode, and make my session of Firefox full screen. Or, I open up VIM. Having played a bit with PenZen, I like it as well. I am not an expert with VI/VIM, but I like the online version here. VI Online. Blogging is quite a bit different from being a full time writer. At least I think so. Are there any writers that read my blog? If so, what do you use to be a distraction free writer?